U.S. rents hit 20-year high. The U.S. Census Bureau reports Thursday that the cost of renting a home continued to rise through the end of 2015, as vacancies remained low and home-ownership declined. The median asking rent for vacant units hit $850 in the fourth quarter, up from $799 a year earlier. 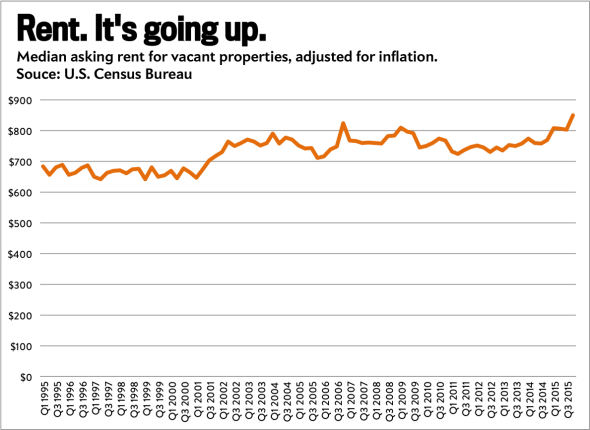 After adjusting for inflation, rents have now passed the peak they hit during the housing bubble. I’d guess we should expect more of the same as the historically high percentage of young adults living with their parents leaves the nest and crowds the market. That’s of course assuming we can avoid a recession long enough for them to all find financial stability. Happy Thursday!